GEI Luncheon in honor of Dott. Carlo Cottarelli, Executive Director of the International Monetary Fund – New York, July 17, 2015. Good afternoon, ladies and gentlemen. Today I am very pleased to welcome to New York and to GEI the Executive Director of the International Monetary Fund, Dott. Carlo Cottarelli. Dott. Cottarelli received degrees in economics from the University of Siena and the London School of Economics. He then joined the Research Department of the Bank of Italy where he worked from 1981 to 1987 in the Monetary and Financial Sector Division. After working for about one year as head of the Economic Research Department of ENI, he joined the International Monetary Fund in 1988, working for the European Department, the Monetary and Capital Markets Department, the Policy Development and Review Department and the Fiscal Affairs Department. He served as Deputy Director both in the European Department and the Strategy, Policy and Review Department, and as Director of the Fiscal Affairs Department between November 2008 and October 2013. While at the IMF, Dott. Cottarelli worked on several advanced, emerging market, and low-income countries in the context of surveillance, IMF-supported programs, and technical assistance, including Albania, Croatia, Hungary, Lebanon, Russia, Serbia, Tajikistan, Turkey, Italy, and the United Kingdom. As Director of the Fiscal Affairs Department, he was responsible for the development of the Fiscal Monitor, one of the three IMF flagship publications. He has written several papers on fiscal and monetary policies and institutions, and edited books on fiscal policy, inflation, monetary policy, and exchange rates. From 2013 to 2014, he served as Commissioner for Public Spending Reform in Italy. In November 2014, Dott. Carlo Cottarelli returned to Washington and the IMF to become Executive Director for Italy, Albania, Greece, Malta, Portugal and San Marino. It is especially interesting to have Dott. Cottarelli here with us today in light of the current debt crisis in Greece. We are both grateful for his presence during this busy period and very interested in hearing about his recent activities at the International Monetary Fund to help to resolve this crisis. Therefore, I am pleased to welcome Dott. 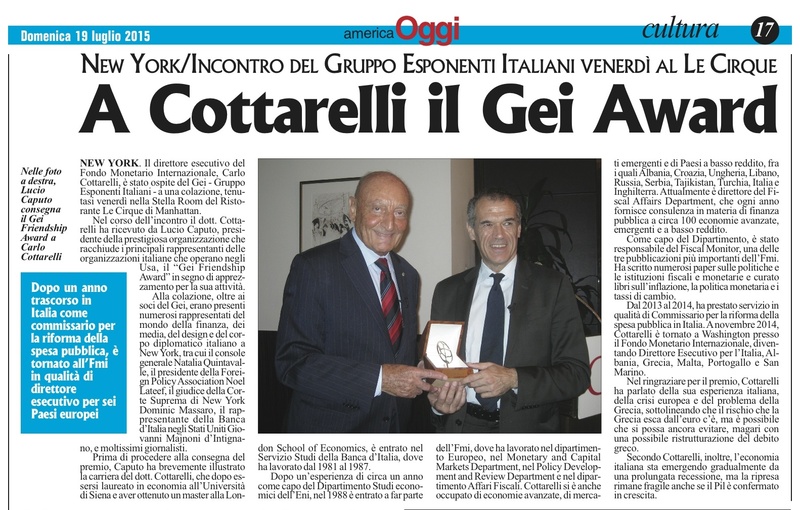 Cottarelli and present him, on behalf of GEI, with the “GEI FRIENDSHIP AWARD” in recognition of his many accomplishments.